Must say I really love working with this style and the selection of buildings available is really good. Have to work on the effects and finish the city, I cant seem to get the citywalls with shadow without screwing them up completely. Any ideas? 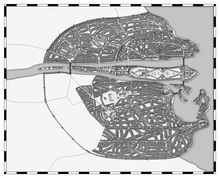 I'm going to work on the harbour and finishes the city next. 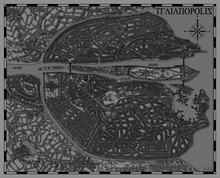 The program is still running fine with this huge city which is great news ! Working on a B&W city myself but not this huge. Must be a lot of work. In case you want to make cities there are great tutorials by Gandwarf and Clercon. Posted By: Henrie61 Very well done. New version, added 3 seperate walled area and attempted to create a moat but that didnt go too well. 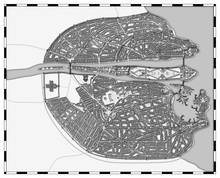 Usually when they wanted a moat for a city based on a river they made sure the river split at the desired points. So you could try to draw two smaller rivers that run around the city. That's actually a great idea. It will make it look more natural as well. I'll just extend the city walls a little. I would've been easier to do the moat first now I think about it but oh well, how is Zibor city coming along? Zibor city (its onle a working name) is coming along slowly. A bit of progress but not that much. Maybe some work later today. Will post an update. It's amazing to watch these maps as you build them. Done, took quite a while to tweak the fields and do the effects. I've made 2 versions a lighter version (less shadow) and a darker version. Notice the difference in actual shadows is only 25%. It surprised me how this small changes the look of the map completely. Which version do you prefer? Any ideas on how to improve this map? Either way, really really cool map. I prefer the dark one also, it gives a better contrast, but both are great . As for ideas the only thing I might suggest is to give the water a bit of dimension. Thanks for the comments. I personally prefer the darker map as well. I'll tag this city later when I have decided which city on my this is. Gratz, think this turned out very well. A new texted version, I used GIMP to darken it further and added some texture. The texture and the watercolor-like filter are neat, but I'm curious why you darkened it so much? I love everything else about your amazing map but, honestly, I think it looked much better when it was lighter. Otherwise, as I mentioned, it's amazing. Bravo on a masterful map. It's the kind of map that makes you want to explore every nook and cranny to find new details. To make this style look darker and giving it more contrast simply increase opacity on the wall shadow. The standard is 35% for this style and if you raise it to 50% and increase length is already shows a remarkable difference. Just figured this out actually.